Student Cultural Exchange’s “Lacrosse and Service” program represents a unique opportunity for young lacrosse players to work on their skills and simultaneously give back to the game in an inspiring tropical setting. Participants in the program will split their time between practicing their lacrosse skills on different well-kept fields in the Costa Rican landscape, teaching the sport to children in the local communities we visit, and taking advantage of the natural beauty of Costa Rica with various fun, adventurous outdoor activities. 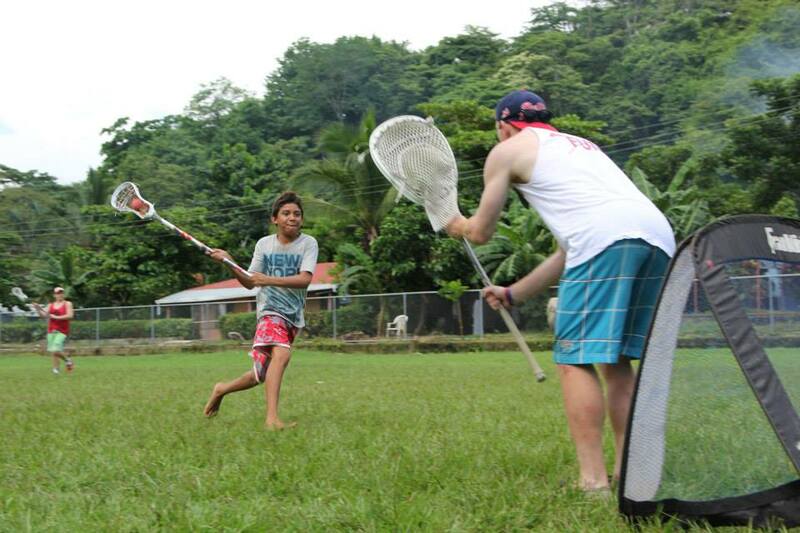 As part of the lacrosse coaching component, our travelers teach young Costa Ricans the basic mechanics of the game, including throwing, catching, ground balls, and the other simple rules of the game. As the 8-day program progresses, the lacrosse lessons become more complex and incorporate fast breaks and full-field scrimmages. Our travelers will also play lacrosse themselves in small 3v3 scrimmages so the Costa Rican youths can see how the game is meant to be played! At the conclusion of the program, our American travelers donate any equipment – from sticks to helmets and gloves – that they were able to bring to Costa Rica. The tropical climate of Playa Samara and Puerto Jimenez provides ample opportunity for varied, exciting outdoor activities. Taking advantage of the lush jungle and beautiful beaches is an important element of our trips. Every day is filled with a different exciting activity, including ziplining, jungle treks, surf lessons, and beach yoga. Please note that the safety of our travelers is always our first priority, from the planning and design of programs to the implementation and completion of our adventures. Our deep knowledge of Costa Rica as well as our close relationship with expert guides translates to the safest possible experience for our travelers. Travel Day. Players arrive at the airport in Costa Rica and heads to the Samara/ Carrillo area on the Guanacaste Province of Costa Rica. After checking into their hotel, the group heads down to the beach for a quick swim before dinner and orientation session. After a morning pick-up lacrosse game on the beach, the group takes part in jungle canopy zip-lining. After lunch the group heads back to the local school for an afternoon lacrosse clinic. The team works on the volunteer project until lunch. Following lunch, the group runs another lacrosse clinic for local children before heading into the jungle for a late- afternoon hike to a secluded beach. Following dinner, the group heads to the local field for a pick-up lacrosse game under the lights. In the morning the group runs a lacrosse clinic at a local school before more work on the volunteer project. The afternoon is spent surfing the gentle waves of Playa Samara. After breakfast the group finishes up the volunteer project they have been working on before lunch. After lunch the group heads to a local school for a final lacrosse clinic at a local school. After the clinic the group explores a nearby turtle sanctuary before heading back to town. Travel day back to the US. what is covered by the tuition? All lodging, 3 meals a day, all activity costs, all transportation within Costa Rica, guide fees and volunteer donations are covered by the tuition cost. Not covered is airfare, snacks and souvenirs. Do players come by themselves or with friends? Both! Players often travel in groups (with friends from teams) but players are also just as likely to join groups by themselves. The varied and super fun activities bring groups together regardless if players knew each other prior to the program! Our lacrosse and Service groups stay at a variety of boutique hotels in Samara, Costa Rica. Previous hotels include, Tico Adventure Lodge and Rancho de la Playa. Student travelers share beds when beds are queen or larger. Twin beds are for 1 student only. Food in Costa Rica (and on our programs) is awesome. Breakfast is usually served at the hotel and is usually a combination of Costa Rican and American breakfast foods, such as pancakes, eggs, gallo pinto, and fresh fruit. Groups eat lunch and dinner at local restaurants in and around Samara. The meals range from traditional Costa Rican meals to pizza. SCE is able to accommodate travelers dietary restrictions. Please alert SCE staff to any dietary restrictions prior to the program. Each day is different, however one common theme is that all days involve lacrosse clinics, volunteer work and outdoor activities. Whether it's surfing in the morning and then heading to an elementary school for volunteer work and lacrosse clinics or heading to a school first thing in the morning for a lacrosse clinic and then zip -lining in the afternoon before an exhibition lacrosse game at night, each day is full of fun and adventure. Do I bring lacrosse equipment? Yes, you should plan on bringing your lacrosse equipment. In addition to lacrosse clinics at local schools our groups often play nighttime lacrosse scrimmages as a way of demonstrating the game. Can I donate older lacrosse equipment? Most definitely! One of the amazing aspects of our programs is the continued desire of the children of Samara to learn and play lacrosse in the time between our groups. Any older lacrosse equipment that players are able to bring to donate is greatly appreciated and put to good use! How old are the children that take part in lacrosse clinics? SCE groups volunteer with several schools in the Samara/ Carrillo area. The children that normally partake in the clinics range from 5-12 years old. Do I need to know how to speak Spanish? Some of our travelers study Spanish in school and our programs allow an excellent opportunity for those travelers to practice and use their Spanish. However, if you do not study Spanish it will not limit your ability to partake and enjoy the program. When it comes to sharing the game of lacrosse, not many words are needed. DIET: RICE AND BEANS ARE STAPLES ALONG WITH BREAD, CHICKEN, MEAT, FRUIT AND SALADS. FUN FACT: COSTA RICA HAS 5% OF THE WORLDS BIODIVERSITY, EVEN THOUGH ITS LAND MASS IS .03% OF THE PLANET.